Mass Effect 2 (ME2) is a 2010 third-person shooter RPG developed by BioWare for the Xbox 360 and Windows; a PlayStation 3 version was released in January 2011. 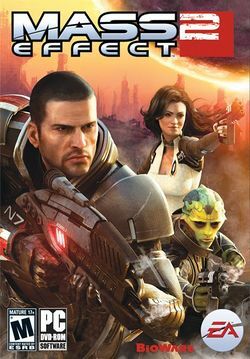 Taking place two years after the first title, Commander Shepard must join forces with a rogue paramilitary group, Cerberus, to repel a new threat to humanity. As Shepard uncovers the truth behind the mysterious abductions of whole human colonies, he must assemble a team of the galaxy's finest and lead them on a veritable suicide mission into the heart of one of the greatest threats the galaxy has ever faced. ME2 was released in both a standard edition and a collectors' edition featuring an art book, comic, and special in-game items. Continuing on from Mass Effect, players step into the role of Commander Shepard—the first human Spectre. After putting the Reapers' plans on hold, Shepard must face enemies just as ruthless and mysterious. To save humanity, Shepard must gather the finest warriors from all corners of the galaxy to aid him. Some say it's a suicide mission, Shepard hopes to prove them wrong. Players who have completed the first Mass Effect can import their old save files to bring their version of Shepard into ME2. Choices made in previous adventures can have striking consequences in Mass Effect 2. Characters who died in Mass Effect won't be returning for ME2. This page was last edited on 19 August 2016, at 16:16.